Wednesday, September 25th, 2013. A Potts Point laneway will be home to open air eateries and community activities this summer as part of a City of Sydney trial to increase outdoor dining options. The improvements to Llankelly Place will give residents and visitors new and interesting options while supporting local businesses. Extra room for outside tables for the duration of the 12-month trial is expected to boost the appeal of the laneway and make it a community focus point. 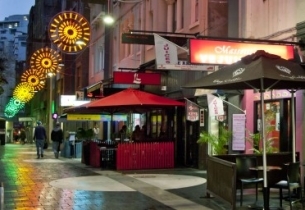 “Llankelly Place is an ideal spot for outdoor dining as it’s close to the main street but wide enough for more tables and chairs,” Lord Mayor Clover Moore said. “Kings Cross is home to a diverse community as well as a destination for thousands of visitors. We want to ensure there’s a range of activities and services for everyone, and outdoor dining should be a part of that. “This is as a great way to activate the public space, encourage visitors and open up new opportunities for small business. It will bring more life and energy to the area, and increases safety. The trial, which starts on 1 October, follows discussions with local businesses about ways to establish Llankelly Place as a hub for community activity. Some of the ideas raised are already underway, including the refurbished of signature “starburst” lighting feature, which was launched with a street party in July, and additional cleansing services. Potts Point Partnership chair Adrian Bartels welcomed the trial. “It’s great that the City of Sydney is exploring new ways to assist businesses with outdoor dining options and create a vibrant dining experience,” Mr Bartels said. “In our area it is particularly important we diversify entertainment and dining options, and change the conversation about Kings Cross. The City will consult with local businesses and residents during the trial to measure the expected increase in trade and determine any impacts on public amenity. There are nearly 500 outdoor dining areas across the city. You can learn more about outdoor dining in the city here.